We built it, but they didn’t come. Not to Mason Pastures, at least–the Cassin’s Sparrows. Over the last year how we’ve worked at preparing for them a habitat they’d never resist settling down in! How many hours did Alex, especially, fork and dig and pull Burroweed in the top end of #3 Pasture to make swaths that would fill (we hoped) with native grasses, and so create a mosaic of plant cover the Cassin’s would surely be skylarking over once The Rains began? We’ve been like royalists preparing a palace for a monarch in exile and hoping it will be found acceptable and that he deigns to live in it. But no … unlike last year and the year before there is no sad, sweet notes lowering see-saw fashion, bursting out in joy from a descending Cassin’s Sparrow. Since the morning of our first Monsoon thunderstorm drenching my ears have been listening for that so lovely a song from that so plain a bird. This heavy-sweat morning I stroll through that now very natural looking mosaic, thrilled by just how splendidly successful those native grasses are. Their masses of flowers, of Three Awns, Spike Dropseed, Cane Beardgrass and various Gramas, wave in a saturated breeze, have waved to those sparrows as those birds must have passed overhead and on north. They didn’t go much further north, though. By the 29th of July El Potrero had had the great gift of more than nine inches of rain in four weeks, and Pat, [a friend] and I were eager to ride up on the Saguaro-Juniper wildlands on that morning and take in the splendor of the flowers and fragrances and green velvet mountains. We saddled our horses and set out with that kind of light heart uniquely born of the return of rain and that all people who live on this desert come to know, and as soon as we got to the first gate out there we began to hear Cassin’s Sparrows. Nowhere in this north end of Cascabel do their songs carry out to the road edge and so I couldn’t be sure if there were any of the birds in these reaches until being seated on that “princely thrown” that is a horse saddle. 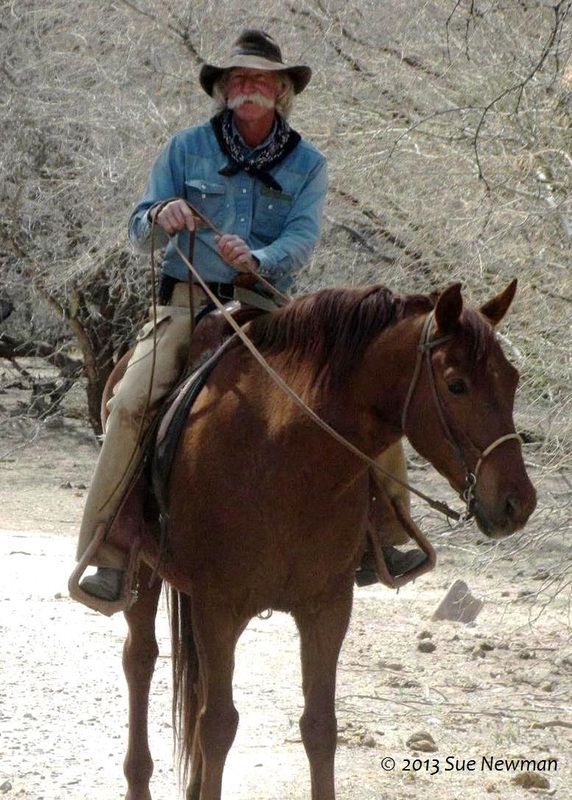 Last year we came on a couple of the birds singing on the Cascabel Pasture when Pat and I rode one day but this time around–there was one after the other giving forth love calls, every few hundred yards along the whole of our big circle of some miles. How far across these mesas and bajadas and grassy flats and knolls of Cochise County were Cassin’s also singing? At least a partial answer to that would come when the day before yesterday five of us (Tom, Nancy, Pat, Sue and I) set out with a steer for Willcox, early as we could to manage the likely wrecked 3-Links Road over the pass and hope the growly Monsoon would hold off long enough for us to get home without a storm cell forming overhead and getting us. It was not quite the same kind of light-hearted setting out of the horseback ride three days before that: there’d been an inch of rain the night before and so there was the promise of adventure in the air on the unpaved road that is washboard, boggy, deep-sandy and deep-muddy in startlingly quick turns. Yet light out we did, open to what the day would bring but knowing there was no guarantee the big truck and a livestock trailer with large steer on board was going to get itself to where pavement resumed on that road on the far side down in the Sulphur Springs Valley, and then get back to the relative safety of the home ranch before sunset. It simply had to be done, and we kept our mind on the gorgeous green landscapes and the spectacle of that Monsoon sky–and on the Tuesday Specials of Big Tex Barbecue in Willcox and the pistachio ice cream next door. After I nosed the Silverado onto the 3-Links Road, though, my mind turned to Cassin’s Sparrows, for no sooner had we straightened our rig and got steam up the first slope did the songs start reaching through the windows. Never mind that those vast cattle ranges are locally notorious for being overgrazed and cow-hammered, they were thoroughly occupied by these Cassin’s, whose voices continued one after the other, ever did there seem to be one coming to us on the dense, wet air. Though–I’m not sure about that unsettling stretch of wildly slidey, deep mud where we lost the bottom of the road and my thoughts got off sparrows and focused on an earthquake-long minute of wrenching the steering wheel hard right and hard left and hard right, trying to keep us from immanent perdición; no way could it be allowed to have that whole rig end up skating to the side or jackknifing into the ditch, and that steer kept from getting to the Harris family’s “Willcox Meat Packing House and Wild Game”. Or worse!–getting to the ice cream shop after it closed. There was sudden, comfortable silence for a few moments in the cab when it looked like we were going to make it on from the end of slithering up that grade, then before long my mind softened back into listening for more Cassin’s Sparrows and sure enough, they kept coming almost without pause on one side or the other for many a mile, as we came down off the saddles and passes and to the edge of Willcox town itself. Maybe it took me a long while to become aware of and learn that song of the Cassin’s and that in reality they’ve been around here in numbers and I didn’t know it, but there seems to have been an explosion of the species in the last few years–though its range maps show it to be more a Chihuahuan than a Sonoran Desert bird. Some writers and authorities are still in 2017 referring to it as a “Species of Concern” but what I’m observing here is apparently holding true enough in other parts of its breeding territory that some time in the last year other authorities have quietly dropped the Cassin’s Sparrow off that list. This gives our work at Mason Pastures less snap, I can’t deny, since it was pretty exciting that species of this kind of interest were finding a home in our irrigated pastures. But I’ll gladly trade that importance I thought we were gaining, for those songs we now hear all around us when we’re horse mounted and when we drive. “And we shall have music wherever we go” will be true for however long these numbers stay up. Fluctuating the Cassin’s Sparrow population historically has been, not unlike that of other Aimophila sparrows like our Rufous-winged and Botteri’s (the latter have also yet to come back to Mason’s), but the scientific and conservation world seems lately to be less panicked by those ups and downs of such species. The mildness of the year, the heat, the rains that have come to us have also made a world very safe for the Cassin’s. As it changes, the climate is bringing so many “Mexican” species more frequently north over that fiction known as The Border that sightings of Slate-throated Redstarts, Rufous-capped Warblers, Flame-colored Tanagers, Tufted Flycatchers, and insects lovely or nasty too from the more tropical south don’t raise eyebrows as high as they once did. Vampire Bats are reported from less than 200 miles south of us–and we thought those now eradicated screw worms were bad for cattle. (Talk about Nature “batting” last!) I’m watching out for things rather less disturbing, like the large and magnificently-branched etcho, that cactus icon of those forests surrounding Alamos in Sonora where 30 inches of rain fall in their three months of Monsoon. Can’t wait to see those etchos shooting their arms up through the pink or yellow mist of amapa trees in bloom! At the rate it’s all changing, will that be next year?